Screen: Most home theater designs will begin with your screen. We partner with Dragonfly™ screens to offer a variety of options so you can find the one that best fits your room scheme. For one, you have to take your room length and height into account. You’re going to want your screen to be mounted central on your wall, leaving space below and to the sides, so you want to pick a size that gives you some breathing room. Whether you’re watching a TV or a screen in your theater, you want it to be at eye level, so it should always be raised a few feet off the ground. If you have a surround sound setup, you also want to leave room for a center speaker to go under the screen. That’s also why you want space on the sides, in order to place your front side speakers. Seating: The size of your screen will directly affect your seating design. It will determine how far back, wide, and high you should sit. For example, to not strain your eyes, you should be sitting at least ten feet from any screen over 100 inches. Each screen also comes with a viewing cone. This is the area where you can see images without a dip in quality. The experts at Profocus Home Entertainment make sure all seats are comfortably placed within this zone. If you are investing in a larger theater with multiple rows, you need to match them up correctly with your screen. Your bottom row should be looking at the lower third of the screen while the top row should be looking at the top third (but never above the screen). Speakers: Once you’ve got your screen and seating in place, it’s time to finish it off with some quality surround sound. This is a pivotal part of your home theater design. As far as your equipment is concerned, we recommend going with Klipsch’s line of home theater speakers. To get fully immersive, realistic sound you should opt for a Dolby Atmos 7.1.2 setup. In this setup, you have three speakers in front of the viewer, one on each side of the screen, and one center speaker. The center one can go under your screen or, in some cases, even be placed behind it. You should also have a subwoofer between your center speaker and one of your front-side speakers. The rest of the 7.1.2 setup includes two speakers to the side and behind the viewer. These are placed at just the right angle to be equidistant from the audience for uniform sound. Finally, to recreate the overhead sound, two ceiling or upward-firing speakers are added to the layout. 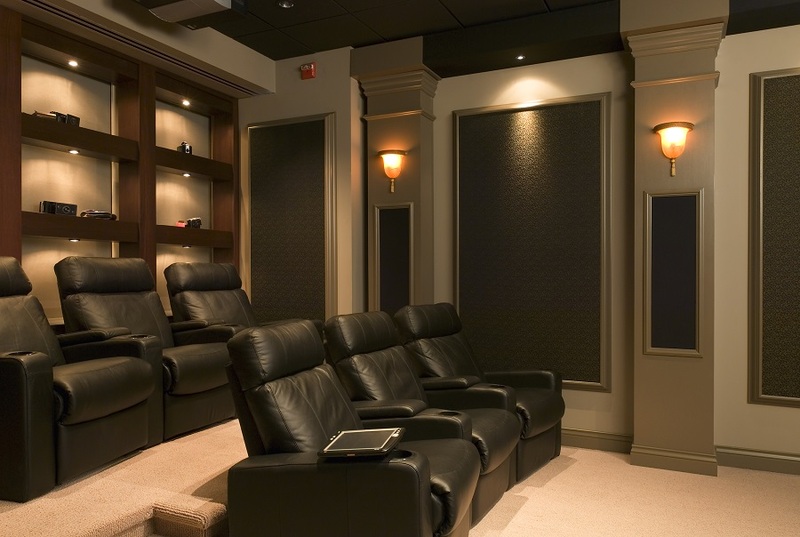 Make sure your private home theater is worth the investment. Contact Profocus Home Entertainment to find the design that works best for you.